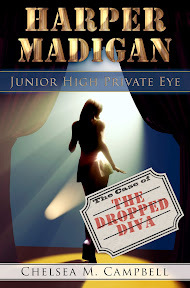 Harper Madigan: Junior High Private Eye is out today! *happy dance* Harper Madigan is a noir detective story set in junior high. See below for a more detailed description. To celebrate, I’m giving away 10 free ebook copies (winner gets the format of their choice), and one grand prize of an ebook copy and a signed paperback once it’s available later this month! The contest starts now and runs through Sunday, March 4th. I’ll announce the winners here on the blog on Monday, so be sure to check back. Winners will be chosen randomly. You can enter once each day on Friday, Saturday, and Sunday for a total of three entries. And if you can’t wait and want to read NOW, you can sample and purchase the ebook at Amazon, Barnes and Noble, Goodreads and Smashwords for $3.99. 7th grade detective Harper Madigan works alone. He doesn’t need the vice principal assigning him a new partner to keep him in line, especially a stuffed-shirt wannabe-journalist who totally cramps his style. And he especially doesn’t need his troublemaker ex-girlfriend showing up out the blue and asking for his help. She’s accused of attacking the star of the school musical, and with her less-than-sparkling track record, she’s only one suspension away from getting expelled. Only Harper believes she’s innocent, and now it’s up to him to prove it, even if it means making an enemy of the PTA mafia, risking his agency, and confronting the mistakes of his own dark past. But when his new partner insists on doing everything by the book, and his old nemesis–the one bully he can’t catch–starts harassing his clients, it’s going to take more than just detective work to solve the case.